Gannett Co. has asked the FBI to look into an onslaught of fake Facebook followers on its page on the social-media platform. Gannett said the number of fake accounts is so large that it accounted for half of the newspaper’s following on Facebook, according to a Friday report from USA Today, part of the Gannett Co. This isn’t a new problem. Last month, Facebook weeded out 200 million fake accounts from USA Today and other publishers. Those deleted accounts included more than one-third of USA Today’s 15 million Facebook likes at the time. The USA Today Facebook page now has about 8 million likes. 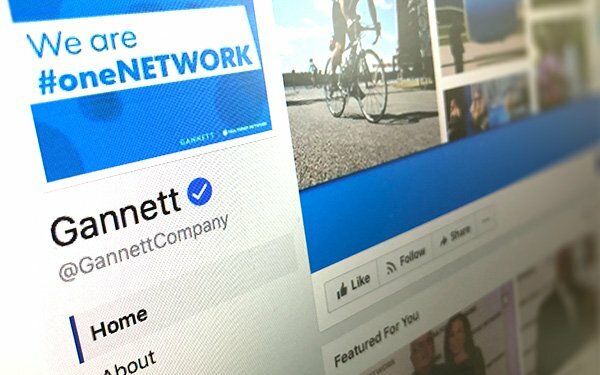 Executives of Gannett, which owns 109 other local news properties, said last week that millions of its remaining followers are fake and that it has tapped the FBI for help. Maribel Wadsworth, the publisher’s chief transformation officer, said in the newspaper's report that Facebook told Gannett it planned to purge another 3 million accounts soon, which could bring its number of followers down to 6.5 million — a painful cut at a time when a large social following is a sign of success in the publishing world. "After we identified the additional set of violating accounts, we notified our partners at USA Today and are taking action against these accounts," stated Shabnam Shaik, technical program manager on Facebook's protect and care team. "We don’t know why the scope of impact on USA Today’s Facebook Page appears greater than any other publisher," added Shaik. Gannett said USA Today gets about 1,000 fake followers a day on Facebook. In Securities and Exchange Commission filings, Facebook said about 1% of its monthly worldwide active users are "misclassified" accounts, most of which it believes are outside the U.S.
Facebook has 1.94 billion users. This morning, The Telegraph reported Facebook has deleted thousands of fake UK accounts and launched a media campaign to educate the public about fake news. The hope is to stop the spread of fake news ahead of the UK’s upcoming general election, called by Prime Minister Theresa May on June 8. The campaign includes full-page print ads in big British newspapers published by Facebook and Full Fact, a fact-checking company. The ads provide a list of 10 tips and red flags for identifying fake news on Facebook and elsewhere. 2 comments about "Gannett Asks FBI To Find Fake Facebook Followers". Chuck Lantz from 2007ac.com, 2017ac.com network, May 8, 2017 at 4:18 p.m. The bad news is that this will not only practically eliminate fake accounts, but it will also cause legitimate participation to drop to some extent, but that's the price that must be paid. Think of it as if it were one big block party; If you let anyone in, without ID, and with almost all of them wearing masks, you're gonna have a problem. Joe McGrail from Engagement Labs , May 9, 2017 at 11:55 a.m. I agree that Facebook can do a better job at veriftying registration and accounts but the underlying problem of fake likes falls within the brands themselves. Someone in both Gannet and USA Today bought a tremendous amount of likes to play the vanity game with others in their category.